Quote It's not as loud as you would think. David Link walks around his hives, carefully pumping out smoke from a small canister in his left hand, aimed towards the thousands of bustling bees flying in and out of the boxes. He's covered head to toe and wears a tan safari-looking hat with a net to protect his face. Bright blue latex gloves cover his hands. "I had a slight hesitation of being around a stinging insect in the beginning," Link admits. "But once you get one that works easily... it's a real pleasure being with them." I'm quite content with the my bee situation this year. Although the maples came out too early, the cold returned in March slowing the emergence of flowers. Although some losses occurred, the current situation is nothing like last years awful early Winter, hot February and April. The poplar bloom last year was both light, and short in duraton. All the plants and trees thus far are blooming very heavy this year. So I have one hive that exploded this year very early. I split the hive, but the hive had already kicked into swarm mode and had made a decent crop of queen cells. Most normal hives will swarm once the queen cells near being ripe, some some breeds such as Russians will swarm up to 10 or more times during a swarm cycle. My wife had captured a swarm from said hive yesterday. Sometimes if a hive is strong, virgin queen mating flights can be mistaken for swarming. This morning in the rain, there was a decent bee vortex in my front yard...expletive deleted. As the day wore on, it became clear this group of bees were not a stranded posse accompanying a queen to the mating spot, but a small swarm. These poor bees endured the torrential rains this afternoon. I gave them something sweet, and got them in a hive box. 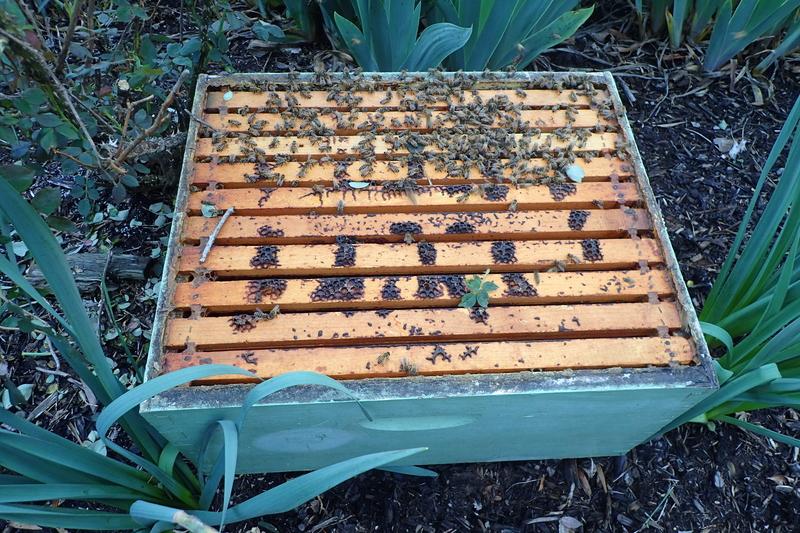 Quote from: Onslow on April 14, 2019, 20:01:56 pm So I have one hive that exploded this year very early. I split the hive, but the hive had already kicked into swarm mode and had made a decent crop of queen cells. Most normal hives will swarm once the queen cells near being ripe, some some breeds such as Russians will swarm up to 10 or more times during a swarm cycle. My wife had captured a swarm from said hive yesterday. Sometimes if a hive is strong, virgin queen mating flights can be mistaken for swarming. This morning in the rain, there was a decent bee vortex in my front yard...expletive deleted. Very cool. This is how you treat immigrants, particularly ones that work their asses off. The web of life can only be snipped so much without the whole web unraveling. Damn thing is about to come appart. Saw that someone has put some hives out in the corner of Reynolds Gardens native plant fields You cannot see attachments on this board. Quote from: Woolly Bugger on April 15, 2019, 14:25:40 pm Saw that someone has put some hives out in the corner of Reynolds Gardens native plant fields You cannot see attachments on this board. Time for an instagram selfie...dufus gets stung by bees, runs into tree head first while looking at phone and becomes paralyzed from neck down.